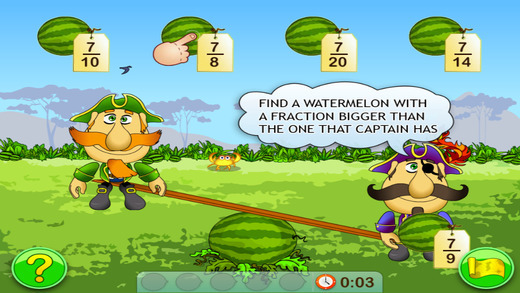 Fractions a﻿nd Smart Pirates is an app designed by Virtual Space OOO for the Ipad. Developers state that the app is intended for ages 6-8 but I see no reason why it can't be used as a fun review of simple fractions for any age. The app can be purchased for ITunes for $2.99 OR can be purchased in a bundle with Virtual Space OOO's percentage game for $2.99. 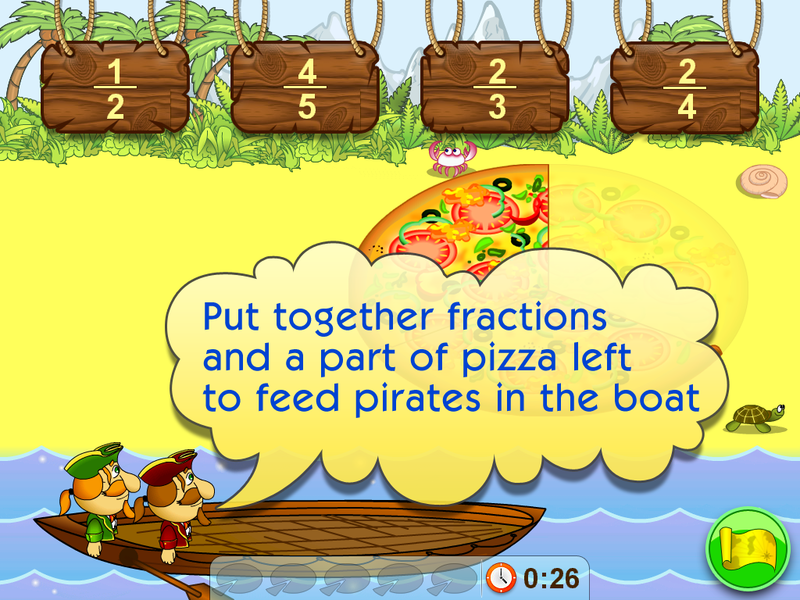 Fractions and Smart Pirates features four "islands" on which students must use their knowledge of fractions to help a friendly band of pirates solve problems in order to complete their journey. Students are carefully guided through the process of recognizing fractions to using fractions themselves without being made to feel as though they are failing if the get the question wrong. Students may choose whether to play at easy, medium, or hard depending on their personal comfort level. Overall, students seem to really enjoy this app. It offers them enough animation and story line to be entertaining without pausing for lengthy monologues as can sometimes be seen in children's games. As with any app, the value for your classroom can only be determined by you; so give it a try and comment below to let others know what you think! Recently, Acclerated Reader released their A.R.360 Informational Reading platform designed to present students will relevant, interesting non-fiction pieces of writing. A.R.360 enables you to create groups with unique log-in codes which can allow you to assign reading based on Z.P.D., table groups, common interests, etc... within your class (or you can assign pieces to your whole class). Finding content is easy as A.R. has already separated articles by Grade Level and/or ATOS. You can choose to utilize the articles and corresponding assignments offered by A.R. or you can find articles online and use the A.R.360 Bookmarklet to scan and import the text! texts that you select to use with students will be saved into your library, making texts easily accessible across multiple groups. If you choose to use the preexisting content, students will receive not only a copy of the article to their file but also an accompanying assignment. These short assignments usually ask students to highlight and categorize the main idea and supporting details. Students must then type complete sentences explaining their previous selections. Each assignment concludes with a short quiz similar in format to traditional A.R. quizzes. However, quizzes taken on A.R.360 do not contribute to students' A.R. quiz data at this time. 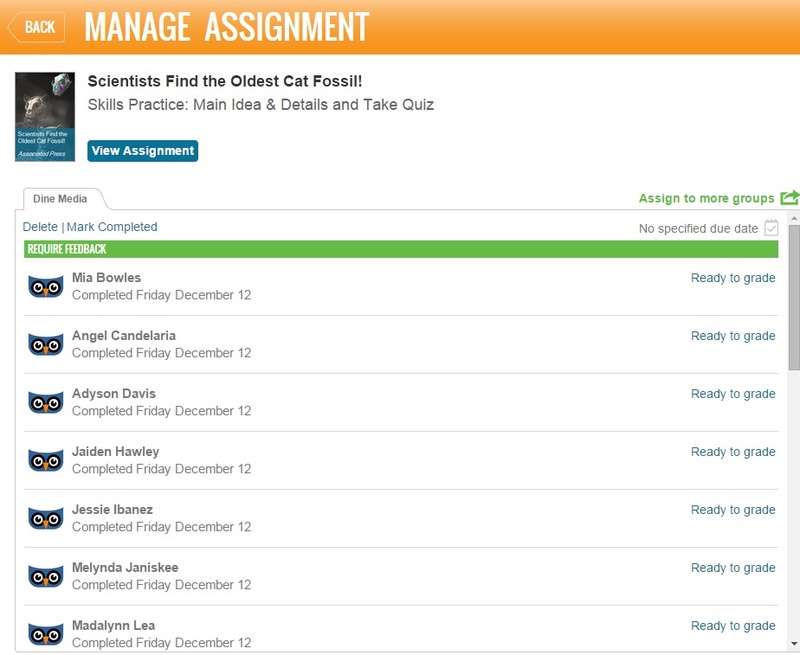 Once students have completed their assignments they can easily be read and graded within the A.R.360 platform. After the grade is submitted, students can view it by logging in to their A.R.360. Unfortunately, the pricing for A.R.360 is very steep coming in at nearly double the per-student rate as that of traditional Accelerated Reader. Whether the benefits outweigh the cost should be considered by the teacher. *** As A.R.360 is still very new, expect to see numerous changes over the next several months. As teachers, we are all familiar with having students who struggle to understand the abstract ideas of mathematics. Often students have a hard time visualizing concepts; or, if understanding is gained, it seems to be forgotten when instruction moves on to the next topic(s). Many students report being able to retain information better when the teacher takes time to walk them through the processes and when repetition is used in instruction. This is all well and good but what do we do in a time when Common Core is King and there never seems to be enough time in the day? And furthermore, how can our teaching remain with the students after they leave our classroom? Here enters a possible answer in the most unexpected form. Most internet users have come to be familiar with GIFs (Graphical Interchange Format) which are short animations or videos which play on a loop and can be embedded in most web applications. Often GIFs are meant to be humorous or used to personify a writer's text. For an example, check out Ashlee Perez's article "31 Signs You've Been a Teacher too Long" on BuzzFeed.com. But what if we could use these same simple, silly visuals to help students master concepts... deep breath... WE CAN! Not only math but literature, writing, history, etc... the possibilities are endless. The addition GIF below is a great example of how a concept which may be difficult for students to grasp can be so simply represented that even as adults, it may cause some "Saturday Morning Cartoon" light bulbs to ignite! You can create GIFs using videos that you record or even videos that you find on Youtube. Truly GIF creation is very quick and easy and might just be the extra push some struggling students need to succeed. Imagine being able to see your teacher physically manipulate a math problem over and over at will... Many free GIF creation sites such as imgflip.com can be found online; however, most of these sites place a strict limit on the number of GIFs per day and frames per GIF they will allow you to make using their site. Those who are comfortable using photoshop may find that as a more viable option when it come to GIF making. Again, Math is just one avenue that GIFs can be seen as instructional aids; the possibilities are only as limited as your imagination (and let's be honest, time)! Planbook.com is an interactive lesson planning site which was created by teachers for teachers. It features a flexible platform the allows you to create your own schedule hour-by-hour, day-by-day, week-by-week, etc... Each class or subject can be assigned a color; making your plans easier to follow and understand. Planbook has also included many of the major national and state standards separated by subject AND grade level. Assigning these standards to each lesson is as easy as "search, select, and apply". You are also able to import your own set of standards if they do not already appear on Planbook's extensive list! The site offers a 30 day trial for new users to try it out but at a very reasonable $12/year you won't be too upset when your trial period runs out! Other benefits of using Planbook include the ability to copy and paste lessons across classes, weeks, and even years (you are even able to choose to copy only lesson description, standards, all, etc...)! "Teacher Keys" can be used between colleagues to share lessons or events while "Student Keys" gives limited privileges to students (or substitute teachers) who you wish to have access to your plans as well. Perhaps the most useful aspect of using Planbook is that it is 100% web-based which allows for instantaneous saving as well as enabling you to access and alter your plans from anywhere that you have an internet connection. Other notable features include: PDF saving, iPad Application, search capability, earning free months by referring other teachers, and the ability to attach notes. Some negative attributes that I've noticed in my own exploration of Planbook are: sign-in timeout, glitchy copying and pasting at times, and slow navigation between weeks. All in all, Planbook.com seems to be constantly morphing to better suite its customers with teachers' needs in mind. While online lesson planning may not be for everyone, those who are interested in taking the plunge may consider checking out Planbook.com!